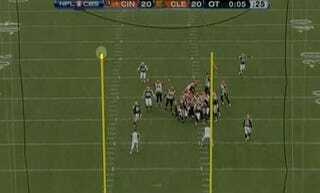 Was This A Missed Field Goal? Cleveland Browns defensive coordinator Rob Ryan is making a big, passive-aggressive stink about the 31-yard kick you see here, the Bengals' game-winner over the Browns on Sunday. Alleged game-winner. You can watch the video below or here. The kick does indeed appear to cross in front of the bar, but I will withhold judgment until we can re-enact the play ourselves with small woodland creatures.